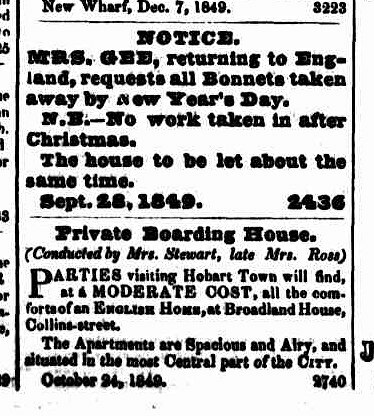 It is with regret that we have to announce the death yesterday of Mrs. Roberts, of ''Beaumaris" Hobart. She was in her 81st year. When well advanced in age, she developed a hobby for zoological studies, and established at her home a collection of examples of Tasmanian fauna that made her famous amongst nature lovers. Her private zoo had been visited by many thousands of people. She had shipped specimens to the (London Zoological Gardens, and also to other zoos, and was probably the greatest authority on the character and habits of the Tasmanian devil and the Tasmanian tiger. She was the widow of Mr H L Roberts, one of the founders of the firm of Roberts and Co Ltd, Hobart, which is still managed by members of the family. "In 1877 Mary and her husband built Beaumaris on two acres (0.8 ha) of land between Newcastle Street and Sandy Bay Road. Mrs Roberts was interested in birds: her aviary may have been started in her former home, Ashfield, but the major hobby-collection she developed in the grounds of her new home became the basis of the Beaumaris Zoo, opened to the public in 1895. "Mrs Roberts had no formal scientific training, but was skilled in animal care. Her zoo, set in attractive gardens, became noted for its display of thylacines as well as birds. The first Tasmanian zookeeper to attract international attention to indigenous Tasmanian fauna, she was elected a corresponding member of the Zoological Society of London in 1910. She was well known as the first to breed Tasmanian devils in captivity, publishing a study of her achievement in the society's Proceedings of 1915. "Mrs Roberts joined in many social issues. Concerned for the welfare of native animals, she founded the Game Preservation Society and the Anti-Plumage League (1910) and was responsible for the Royal Society of Tasmania's campaign to strengthen the State's protective legislation. She helped to found the Tasmanian branch of the Girl Guides' Association, was a council-member of the Art Society and the Mothers' Union, committee-member of the National Club and Young Women's Christian Association and a delegate to the Tasmanian National Council of Women. She also belonged to the Royal Society of Tasmania, Victoria League, Hobart District Nursing Association, Cat Society, (Royal) Society for the Prevention of Cruelty to Animals, Avicultural Society, Tasmanian Field Naturalists' Club, Linnean Society, Liberal League, Queen Mary Bridge Club and the Orpheus Club. "Mrs Roberts had strong moral views (disapproving of a 1912 pantomime because of the brevity of the mermaids' costumes) and was intensely patriotic. She raised a fund to erect a statue to King Edward VII and during World War I ran charity afternoons at the zoo, often with vice-regal patronage; when St David's Cathedral refused to lend seats for a Belgian Relief Day she transferred her religious allegiance to St George's, Battery Point." 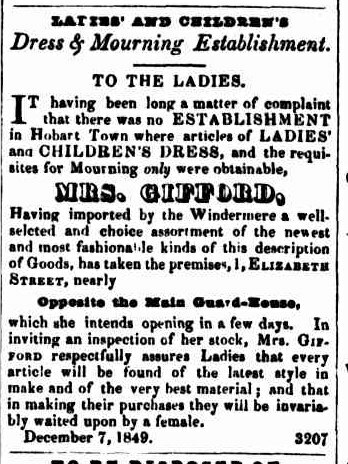 I trawled the first three years of the Sydney Gazette (1803-1806) to see what I could find in the way of advertisements from women. 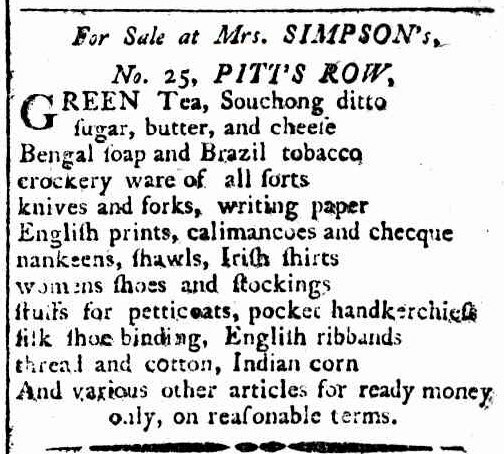 The population of the town, less than 20 years after the start of British settlement, was just a few thousand, so there probably wasn't much need or incentive to pay for ads. The Gazette came out once a week, and for was often only of two pages, so not a lot of room for ads either. (And as you can see the scans are low quality so searching the OCR text for keywords is... interesting.) But I found a handful easily enough. There passed away yesterday, at her residence, 193 George-street, Miss Mary Lodder, a lady deeply respected and well known in church and philanthropic circles in this city. She had been connected with the Ministering Children's' League, Children's Protection Society, and Girls' Friendly Society, but on account of failing health recently retired from active work on behalf of these bodies. But not in this direction alone had her energies been confined. Her loss to the Museum is beyond all estimation, for not only did she assist in her special study--as a conchologist--but by ways innumerable her aid was always at the disposal of the institution. In any new venture her enthusiastic sympathy could always be counted on, and nothing was too much trouble, if? only the result hinted at progress. Her books, instruments, and vast stores of knowledge were a standing asset, and during the class work of the winter sessions she was always hard at work attempting to make the syllabus a success. By nature of a retiring disposition, her real worth only appeared to those who from the force of circumstances were intimately associated with her. At first sight it was almost impossible to guess at the enormous sterling worth of her character; but once the line of conventionality had been passed, the full power of her intellectual capacity became apparent. A member of many learned societies, and known to almost every shell collector in Australia, as well as many in foreign countries, her scientific attainments would have made many a smaller character more widely known: But so quietly was her work done that even her professed friends merely spoke of her as being "interested in shells," and few perhaps grasped the scientific possibilities she possessed, and had she devoted her time completely to study and research, her name might well have been a household word among the scientific world. The deceased was the eldest daughter of the late General Lodder, of "Lonah," Penguin, and her brother, Mr. Ernest Lodder, is well known on the North-West Coast as an electrical engineer of more than ordinary capability. The funeral will take place at Ulverstone on Tuesday, on the arrival of the morning train from Launceston. Miss Lodder was the daughter of the late General Lodder, and spent most of her life at Ulverstone. on the North West Coast of Tasmania. Reference to her work is frequent in Australian literature on the mollusca. Entry on Tasmanian Honour Roll of Women. 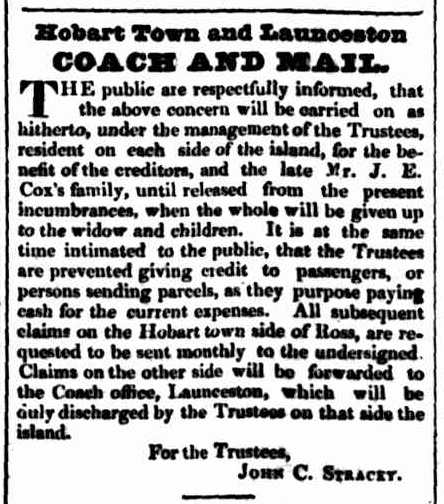 ANOTHER SERIOUS COACH ACCIDENT.-AS Mrs. Cox's coach was proceeding to Hobart Town on Thursday last, an accident occurred at Oatlands which had well nigh proved fatal. It appears that the horses, after being changed, were, through gross negligence, left to take care of themselves. Mr. Atkinson and another person had resumed their seats on the outside, when the horses started off at a furious rate; the reins being down, and there being a precipitous descent before them, the two gentlemen leaped off the coach. Mr. Atkinson fell on the back of his head and was for some time insensible. After being assisted to the hotel he recovered so far as to be able to proceed to Hobart, where lie has since been under medical treatment, and we hope he is now recovering. MAILS.--We are happy to state that the Postmaster-General, as well as Mr. Browne, will in future embrace every opportunity of forwarding foreign mails by Mrs. Cox's coach. We are also informed that that lady is now negotiating an arrangement with government respecting the trans-mission of the local mails by her coach. In referring to one of the means lately proposed as a remedy for this crying evil — viz., the transmission of the mail by Mrs. Cox's coach, which in that case the spirited proprietress undertakes to convert into a kind of locomotive magazine, manned and garrisoned accordingly — we are afraid it would never answer. Who, in the name of fortune, would like to journey by such a warlike conveyance) with the comfortable assurance forced upon the mind that he would have tonight his way ? The conclusion would be natural enough (more especially to a stranger) upon witnessing such 'awful note of preparation;' and we are therefore of opinion, that any attempt of the kind would inevitably prove a total failure. No, no; let the coach continue to be the coach, and the mail the mail : a passenger who takes his seat in the latter does so with a perfect consciousness of what he may be called upon to suffer;but to think of subjecting ladies, and occasionally children, to the terror and alarm of a roadside encounter, is not only cruel, but absurd. This too far long than I thought. I had a couple of news stories, but I thought I'd have a quick look to see if there were any more. Just a few :) I left out those that complaining about the state of the road or fares, or short references to accidents and some repetitive material, but still there was a lot to correct, fix the formatting on and arrange in the right order with the correct attributions. About 37 pages/14,00 words. So I'm breaking it into three parts. I think the results presents an interesting view of a society before motor cars, not to mention the enterprising proprietress of a well-known company, so they're worth reading. 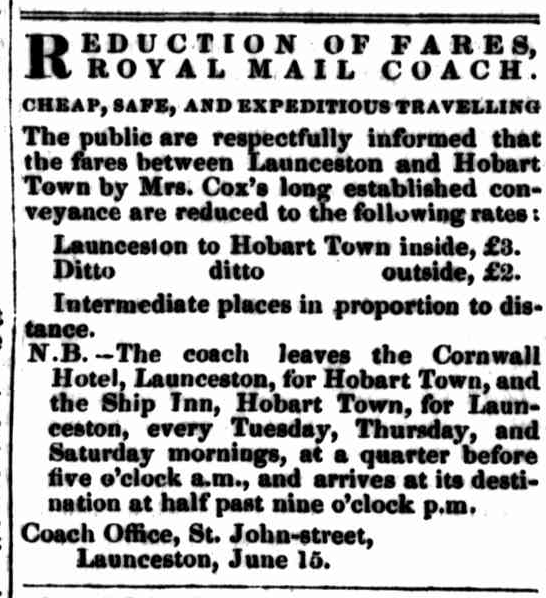 I'll let the news stories speak for themselves, but first a bit of context from Australian Dictionary of Biography, wherein we find that John Edward Cox established the first coaching service between Hobart and Launceston in 1832. He died soon after, in 1837, but it wasn't the end of his business. 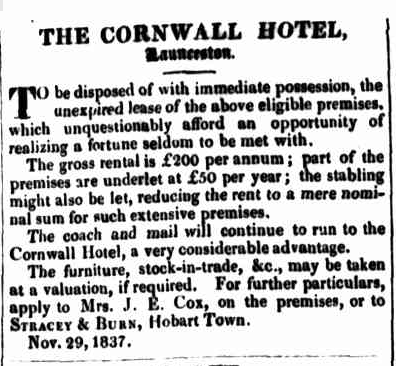 "With great courage and enterprise [his wife] Mary Ann Cox carried on the Cornwall Hotel [in Launceston], and the coaching service with its annual turnover of £4000. By 1840 she had repaid her husband's creditors in full." These two ladies are well known, to the extent that I wasn't going to bother mentioning them, but they do let me draw attention to a problem with this sort of project. The women who leave records of their lives as in business are mostly widows, or otherwise single. Not because married women didn't take part in business affairs, but because their activities take place under their husband's name. It's only when they're prominent in society and/or the husband is obviously not involved the business for some period, that the wife's affairs become obvious. So, here are two women who were both prominent in society and had absent husbands. Maria Lord (which is a bit dry, but I can't quickly find an article that is not). We'll start with the industrial revolution, and the idea that mass production & the removal of manufacturing from the local setting removed women's source of economic & social power (that is, if you don't like someone, you don't buy from them) making them dependent. Although at the same time, the growing demand for unskilled labour created opportunities for women to work outside the home. Two points to stop and consider there. Firstly, that phrase "working outside the home". The alternative obviously is "working in the home", which is looking after children and doing housework. But what about self-employment/working in the family business, which includes shopkeeping in all its flavours, inn-keeping, farming, probably most of the "traditional" areas of employment for women, other than service. That could all be considered "working within the home". While we're in that period, two popular topics of conversation in women's history are the nature of convict women (whores or innocents taken advantage of? ), and the kidnapping of indigenous women by settlers. Most debate on both topics seems to rely on the idea that women are passive receivers of whatever at them and they are some homogenous blob that experiences the world in a uniform matter. Fortunately, there's been some more intelligent voices to the discussion in recent times. 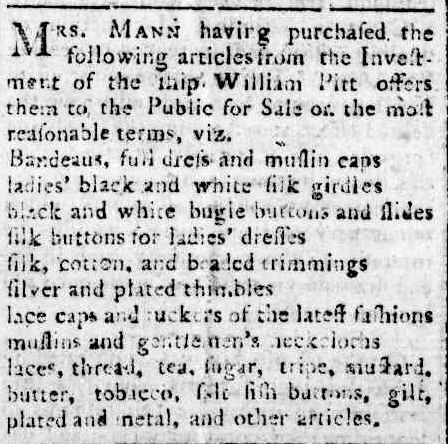 As a side note, while reading for an essay, I found there was much discussion in the columns of the newspapers abut why women would chose working in a factory, with the poor conditions & pay, over being in service. The second half of the century saw an increase in women's involvement in local affairs (charity work & such) and politics in general. Political reforms, changes to property laws, agitating for the vote etc. Obviously this mostly involved the educated, time-on-her hands, middle-class woman. But not exclusively. If you look at the increasing influence of the labour organisations, there are women involved, sometimes in their own right, sometimes by supporting their husbands. (Here's a question for you, when did those husbands get the right to vote? i.e. when was universal male suffrage introduced?). Women are also starting to take more direct control of their fertility during this time. The century turns, women gain the vote in the new Federal government and many of the new states, they have more legal power, influence in the media, and a declining birth rate etc so... there's a push to put women back in the house and have more babies. But then comes this world war thing. 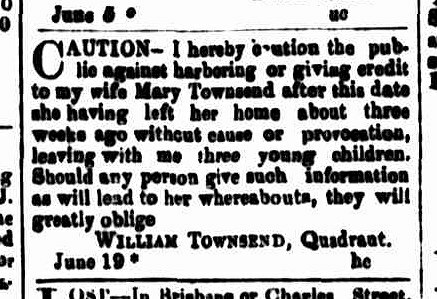 Considering the idea of the Victorian woman as submissive, chaste and obedience, with a case study: Mary Townsend, who in middle of the century lived in Launceston, with her husband William. Mostly. Years ago, when the sports gallery at the museum was being created, Louise (collections manager) wanted to know a bit more about Mary Smith, so I found this article by Irene Schaffer. Mary is another widow who continued on managing her property after her husband died, but of more interest, she trained and raced horses at a time when it was very much a gentlemen-only club. RACE.-A match came off on Monday between Mr. Gee's Jerry Sneak and Mrs. Smith's Grimaldi, for £20 a-side. Jerry Sneak took the first heat--bolted the second between tho distance and winning post, when the race was all his own--and won the third by a couple of lengths. Death has been busy of late with our great public singers. The last who has joined the great majority is Madame Carandini. In Australia, and particularly in Adelaide, no songstress was better known and more highly esteemed. It was Madame Carandini who was one of the first ladies to introduce operas in this colony and, it has been stated that no lyric artiste ever equalled her as the "Grand Duchess," a name afterwards given to her by her musical friends. One of her greatest musical triumphs was her declaiming, in the costume of a French patriotic woman, "The Marseillaise;" the enthusiasm she evoked is one of the red-letter musical events of Adelaide. The Theatre-We are happy to announce that the Victoria was literally crammed last night for the benefit of the widow and family of the late Mr. Bushelle. We have not room for particulars, further than to state, that the singing of Mrs. Carandini was of a most superior order, and unexpected as such a treat was, the audience were not more pleased than astonished. "When she was interviewed by the Clothing Trades Gazette in 1922, Helen told how she and 'three or four' others, among them Lucy Moody and Mary Wise, sick of being 'treated like animals' by their employers, had resolved to start a union.... Helen remembered how she, Lucy Moody and Mary Wise had acted covertly, on one occasion plastering the factories with 'dodgers'–-handbills-–under the cover of night. Another time, she and her band of committed activists led a rally to Parliament House, presumably in support of the Factory Act, wondering all the while how long it would be before they were found out and sacked. Eventually, another worker betrayed them. 'Opposition came from all quarters', she remembered, and she had been labelled 'an agitator' and boycotted by employers. Undeterred, her gang of 'staunch fighters' had 'stuck all along', stoically 'battling the might of the employers' until a Factory Act was at last passed. 'That', Helen recalled, 'was really the starting point of our improvement'." A short entry on University of Sydney's Working Lives labour/social history site. On the Biographical Register page, there's a list of other women in the labour movement, but mostly a bit late for my purposes (active 1890s onwards). I came across a small pile of Midlands Agricultural Society* exhibition certificates that been awarded to Mrs Buist in the 1880s, for produce and working bullocks. Last month, I found some more, so I thought I'd see if I could find some more about her with a quick poke around. Seems she'd been winning at the show for a while. In 1874, the Examiner said, " The exhibits of fat cattle were in splendid condition and were much admired by numerous interested visitors. A pen of three fat Hereford bullocks exhibited by Mrs Buist gained the prize in Class” and the Mercury said, "For the best pen of fat bullocks those of Mrs. Buist showed tho best breeding, and were deservedly awarded a first prize". DEATH OF AN OLD COLONIST.-On Thursday last there passed away to her rest another of the early pioneers of the colony, Mrs Christian Buist, of Pituncarty, at the ripe age of 97. The end was not altogether unexpected by her relatives and a friends, as she had been very feeble for some time and during the preceding week was confined to her bed. She passed quietly away without any apparent suffering. Notwithstanding her great age she retained in a surprising degree nearly to the last her mental vigour and her warm interest in the concerns of her friends and the movements of her surroundings and time. Mrs Buist was a colonist of fully 72 years standing, having left Scotland with her father, the late George Taylor, in 1822, arriving in Tasmania in January 1813. when she settled at Pituncarty, on the Macquarie river, where she spent the remainder of her long and useful life. Continued. This tag and icon are for women I happen to come across who had a life other than being just a wife and mother, or had an adventure, or interesting things, or otherwise don't fit the usual stereotype. Some of them are well known, so I'll just link to another web page. But most of them are ordinary people with nothing already written on them and I don't want to spend too much time writing LJ posts, so I'll try to find something that gives you an idea about them, maybe a transcription of what I found or a link to their obituary. They'll be from 19th century (which an occasional sneak into last century) because that's the area I deal with, and they'll be predominantly Tasmanian, for obvious reasons. Sharing of others is encouraged though. To start with, some I've already covered. Probably more but I haven't tagged them.